An appearance by Abdullah Gül anywhere will always draw capacity crowds right now. Turkey’s former president is the only credible rival to his all-dominating successor, Recep Tayyip Erdoğan, and a gentler, more even-tempered politician. He hasn’t announced what he plans to do next but, at the age of 64, he isn’t about to retire from public life yet. So it was little surprise that the largish room in the basement of Chatham House, the Royal Institute of International Affairs in London, was packed to burst to hear Mr Gül speak. Disappointingly, most of what he had to say was about foreign affairs, and not a lot of that was particularly remarkable. He said the Pandora’s box turmoil unleashed in the Middle East – IS, the Arab spring, civil wars – could be traced to the Israeli-Palestinian conflict and the world’s inability to solve it. An independent Kurdistan borne out of Iraq would cause a different kind of instability in the region, he said, adding that he had understood the fear of Iraq being divided expressed to him by politicians in Baghdad. Gül was asked ‘should the powers of the presidency be reformed?’ He was reluctant to answer. On Syria, Gül insisted his country was “never close to Assad regime” and had tried to engage with it purely because they were Turkey’s neighbours. Russia is a neighbour and trading partner, he said, but “we do not forget that Turkey was an important wing of the NATO alliance for many years”. The bulk of his commentary was on Islamic State – which he said should be regarded as an extremist political movement, not a religious one – and the West’s lack of appreciation, as he saw it, of Turkey’s role in hosting Syrian refugees. Two million of them, by his count. It was a clear reference to Mr Erdoğan’s ambitions of reforming his job into a French or US-style executive presidency that essentially returns to him the powers he had as prime minister. “I have already expressed my views on this subject previously,” Mr Gül said in reply, reluctant to expand further. 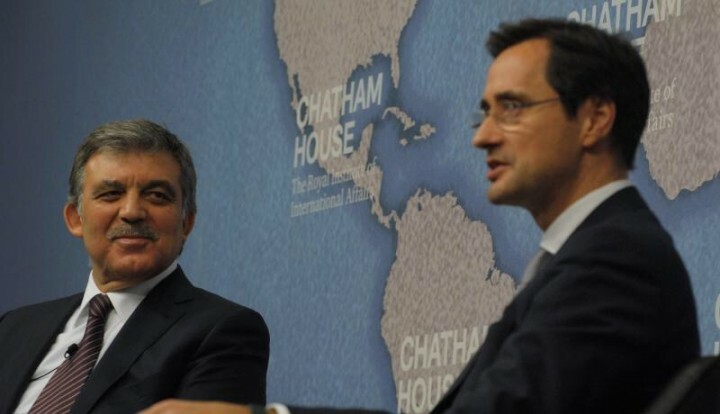 But he was pressed by Chatham House director Robin Niblett, who was chairing the event. “It is well known I prefer a parliamentary system for Turkey,” Mr Gül finally conceded. But a presidential system could also work “with the correct checks and balances”. Everyone had a question for Mr Gül and I didn’t get to ask mine: has he become a member of the AK Party again? Is he running for parliament in next year’s elections? The answer to both is probably yes, but Turkish politics is a fickle thing. You can never be sure.